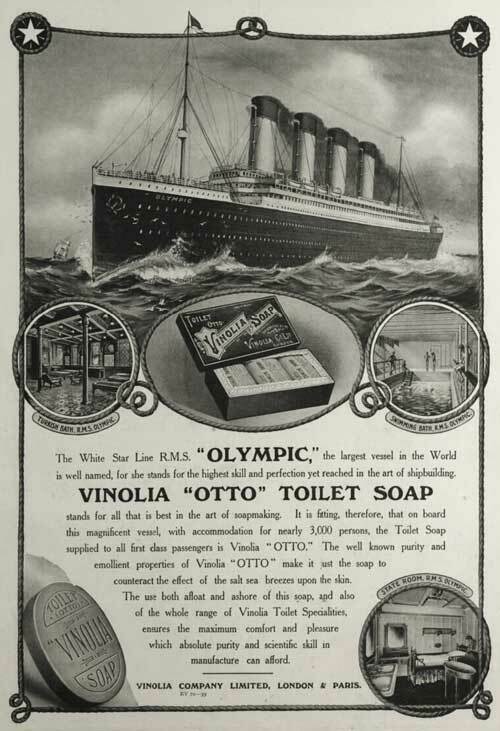 A famous advertisement for soaps used aboard the Titanic. This version depicts the Olympic. In the opening scene of the film A Night To Remember, Lightoller (played by Kenneth More) jokes about the advert with his wife Sylvia (Jane Downs). 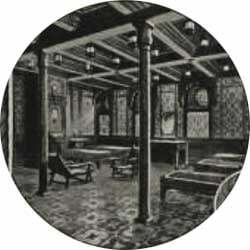 The White Star Liner R.M.S. "Olympic," the largest vessel in the world is well names, for she stands for the highest skill and perfection yet reached in the art of shipbuilding. stands for all that is best in the art of soapmaking. 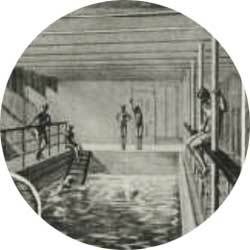 It is fitting therefore that on board this magnificent vessel, with accommodation for nearly 3,000 persons, the Toilet Soap supplied to all first class passengers is Vinolia "OTTO." The well known purity and emollient properties of Vinolia "OTTO" make it just the soap to counteract the effects of the salt sea breezes upon the skin. 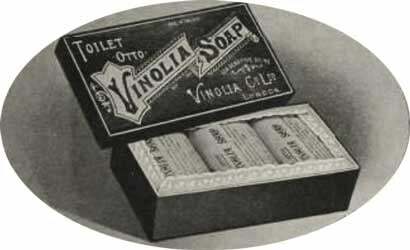 The use both afloat and ashore of this soap, and also of the whole range of Vinolia Toilet Specialities, ensures the maximum comfort and pleasure which absolute purity and scientific skill in manufacture can afford.